Monkey’s 1st Photo Shoot | are you my moms? Sorry to have been quiet for a spell. I’ve truly been too tired to type. Today we had our 8-week ultrasound. I didn’t fully realize just how nervous I was about the appointment until my eyes refused to close last night. I had been anxiously anticipating the day when we’d see the first picture of our little monkey. 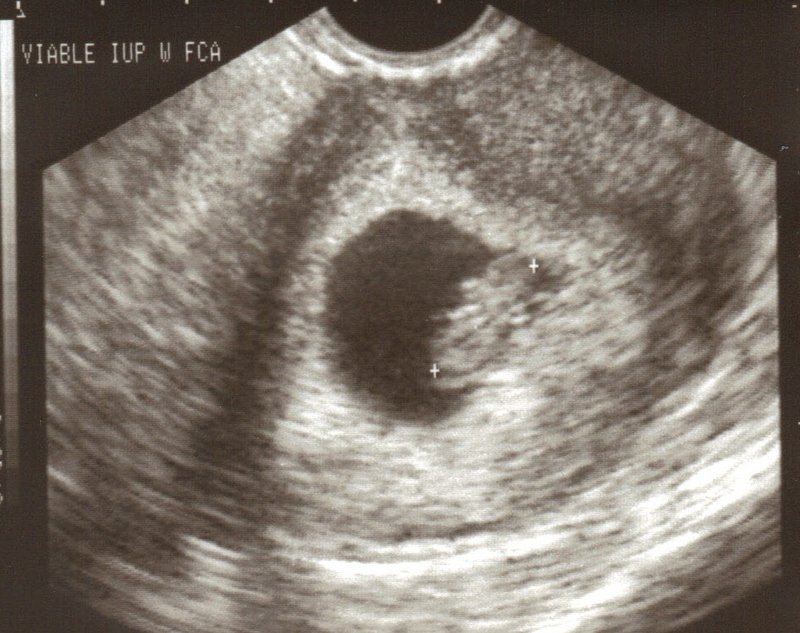 I know early ultrasounds just look like blurry crustaceans. But still, that’d be our blurry little shrimp on the screen – a shrimp only its moms could love. And then sometime last night it dawned on me that today’s scan could show something not-so-good. When the guru called a month ago with my updated hcg numbers, she said that the first ultrasound was intended to confirm that the little monkey has taken root in the uterus and not the tubes, to check for multiples (gulp) and to ensure there was a heartbeat. What I heard: you’re super-dooper pregnant, and the first ultrasound will be the little monkey’s on-camera debut! It was around 8:00 last night that I started considering the other outcomes: we could find out about an ectopic pregnancy, see that I’m carrying a litter (twins would’ve been fine, but there were 3 follicles, after all! ), or see a great little embryo whose heart wasn’t beating. Finally, doc spoke. She turned the screen around and said, “OK – there is your single pregnancy.” She pointed to the inner sac, the outer sac, and showed us an eye and the heartbeat. I still just saw a shrimp, but I didn’t care. Doc said that our little monkey looked great, and congratulated us. She pointed out another little spot on the screen that she called a sub-chorionic separation. At first she thought it was a second sac…apparently the guru and the amateur gyno thought so, too. Nope – the monkey’s all by itself. The sub-chorionic separation is just a small tear in the uterus that should heal itself. Nothing to be too worried about, but just something to keep an eye on. It’s also something that will keep me out of the gym for the next 4 weeks. Oh well. If doc told me to spend the next 4 weeks suspended from the ceiling by my toes, I’d do just that. Then our normally stoic doc melted into a human right before our eyes. Her poker face relaxed into a beautiful, broad smile. I didn’t even know she had teeth! She congratulated us again and remarked that with AMH as low as mine, we’d overcome some serious obstacles to get to this point. She even said that our case would give her reason to be optimistic when another patient presented with wonky hormones like mine. (She might not have said “wonky.”) And then she hugged us and sent us forth with her blessings, our medical records, and instructions to see my regular ob-gyn in the next 2 weeks for another ultrasound. We then went to the window to pay one last time, and the guru hugged us and told us to keep her posted. I cried all the way home. Happy tears, and tears of gratitude for doc and the guru – two of the most important people we’ll ever meet. So without any further ado, I am pleased to introduce you to our little monkey. I think it looks like MKL. Don’t you? A little around the eye, at least? Love love love!!!! So happy for you guys! I think she’s ADORABLE!